This position is perfect for people who are interested in learning more about the care of our animals. 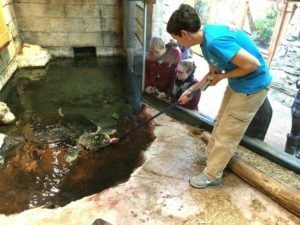 Volunteers work behind the scenes preparing animal food, water quality, and specific exhibits alongside our biologists. Animal Care Volunteers are expected to volunteer weekly and must be 18 years or older. The Animal Care Volunteer Program is currently at capacity. We encourage you to submit an application to be kept on file for when positions become available.